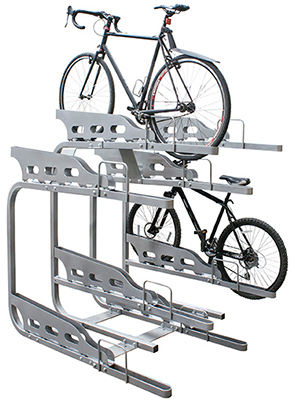 Per square foot the all-steel Dero Duplex doubles capacity of bike parking areas with efficient and orderly storage. The bi-level arrangement utilizes staggered upper and lower trays to allow users to easily rack and un-rack bicycles without any entanglement. The ultra-sturdy trays are designed with high sides and U-Lock compatibility to ensure top stability and security. Configured to accommodate any indoor or outdoor space with four modular design units capable of safely storing up to 6-12 bicycles.